Rajai Davis blasted a walk-off grand slam for the Tigers in the first game of this three-game series. It is the fourth walk-off grand slam by a Tiger while they were trailing since 1983. With the win, the Tigers take a 3-2 lead for the season series that we could see again in the ALCS. The Tigers entered this series after dropping two of three games in Houston over the weekend. Detroit is one of the best offensive teams in baseball: they are sixth in Runs Scored (361), 2nd in Batting Average (.276), and 2nd in Slugging Percentage (.441). With Porcello and Verlander on the bump for the final two games, the Tigers certainly have an advantage, however slight it may be. 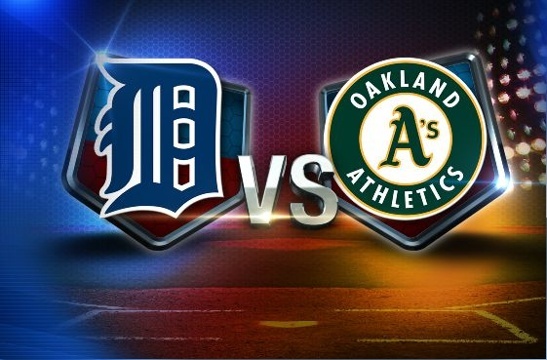 The A’s came into Detroit riding a four-game winning streak after sweeping the Marlins in Miami. Using the main concept from the film-version of Moneyball, the A’s are second in the bigs in On-Base Percentage, which has resulted in the team scoring the most runs in the majors by 30–their 422 compared to the Blue Jays’ 392. The Porcello/Verlander tandem will be an interesting test for the Athletics offense.